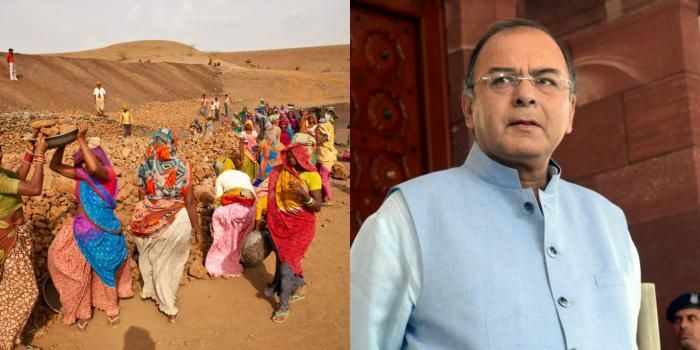 Finance Minister Arun Jaitley on Monday said that Centre proposes to spend Rs 38,500 crores on the Mahatma Gandhi National Rural Employment Gurantee Act (MGNREGA). MGNREGA is an Indian labour law and social security measure that aims to guarantee the 'right to work'. It aims to enhance livelihood security in rural areas by providing at least 100 days of wage employment in a financial year to every household whose adult members volunteer to do unskilled manual work. Starting from 200 districts on February 2, 2006, the MNREGA covered all the districts of India from 1 April 2008.The statute is hailed by the government as "the largest and most ambitious social security and public works programme in the world". In its World Development Report 2014, the World Bank termed it a "stellar example of rural development". Another aim of MGNREGA is to create durable assets (such as roads, canals, ponds, wells). Employment is to be provided within 5 km of an applicant's residence, and minimum wages are to be paid. If work is not provided within 15 days of applying, applicants are entitled to an unemployment allowance. Thus, employment under MGNREGA is a legal entitlement. Jaitley also said that the government will spend Rs 9,000 crores on its pet Swachh Bharat initiative. The Swachh Bharat Abhiyan or Clean India Mission is a national campaign covering 4,041 statutory cities and towns, to clean the streets, roads and infrastructure of the country. The campaign was officially launched by Prime MInister Narendra Modi on October 2, 2014 at Rajghat, New Delhi. It is India's biggest ever cleanliness drive. The program plans to construct 12 crore toilets in rural India by October 2019, at a projected cost of Rs.1.96 lakh crore or USD 29 billion. In the 12th Five Year plan (2012-17), the previous UPA government had allocated Rs.37159 crore USD 5.5 billion for rural sanitation under its Nirmal Bharat Abhiyan scheme. The finance minister said that the government will relaunch its national land record digitisation scheme and fund it with Rs 150 crores. So far, Budget proposals for fiscal 2016-17 are living up to expectation, with a focus on the farm sector with an allocation of Rs 87,765 crores for rural development. There are more announcements for the social sector, including a mission to provide LPG gas connections to women in households.